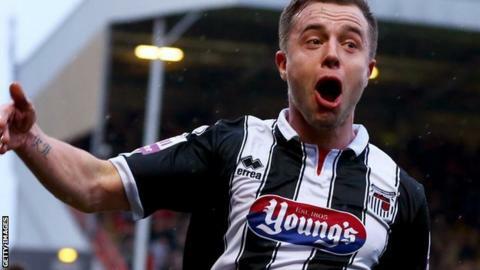 Ross Hannah's hat-trick was only enough to secure Grimsby a point as play-off rivals Alfreton hit back three times. Kick-off was delayed by 75 minutes after the late arrival of the Grimsby team bus due to heavy traffic. Hannah converted Scott Neilson's cross for the opener, but Josh Law was teed up by Paul Clayton for the equaliser. A left-footed shot and penalty saw Hannah twice restore the Mariners' lead but they were pegged back by a John Akinde spot kick and a Clayton strike. Despite their fightback, Alfreton are now six points adrift of the play-offs with just two games left, while Grimsby move up to third above Halifax, who host Macclesfield on Saturday. "Shaun has done exactly just what I told him not to do at half time, gives away a penalty. "We scored three goals away from home and we expect to win the game. "I'm pleased for Ross [Hannah] who gets the ball to take home but I'm sure he will be the first to admit he would have liked it to be with three points as well." Match ends, Alfreton Town 3, Grimsby Town 3. Second Half ends, Alfreton Town 3, Grimsby Town 3. Foul by Ross Hannah (Grimsby Town). Daniel Bradley (Alfreton Town) wins a free kick. Attempt blocked. Andy Cook (Grimsby Town) right footed shot from the left side of the box is blocked. Attempt blocked. John Akinde (Alfreton Town) right footed shot from the centre of the box is blocked. Substitution, Alfreton Town. Shaun Harrad replaces Paul Clayton. Darran Kempson (Alfreton Town) wins a free kick. Attempt blocked. Andy Cook (Grimsby Town) right footed shot from outside the box is blocked. Foul by Darran Kempson (Alfreton Town). Andy Cook (Grimsby Town) wins a free kick. Attempt saved. Daniel Bradley (Alfreton Town) right footed shot from outside the box is saved. Attempt saved. Ross Hannah (Grimsby Town) left footed shot from the centre of the box is saved. Assisted by Sam Hatton with a cross. Foul by Paul Clayton (Alfreton Town). Scott Kerr (Grimsby Town) wins a free kick. Attempt missed. John Akinde (Alfreton Town) right footed shot from the left side of the box misses to the left. Substitution, Alfreton Town. Godfrey Poku replaces Michael Hoganson. Attempt missed. Shaun Pearson (Grimsby Town) header from the centre of the box is too high. Assisted by Scott Kerr. Foul by Andy Cook (Grimsby Town). Substitution, Grimsby Town. Andy Cook replaces Lenell John-Lewis. Goal! Alfreton Town 3, Grimsby Town 3. Paul Clayton (Alfreton Town) right footed shot from the left side of the six yard box to the centre of the goal. Foul by Lenell John-Lewis (Grimsby Town). Attempt missed. Daniel Bradley (Alfreton Town) right footed shot from outside the box is too high. Attempt saved. Tom Shaw (Alfreton Town) left footed shot from outside the box is saved. Attempt saved. Sam Hatton (Grimsby Town) left footed shot from outside the box is saved. Attempt missed. Patrick McLaughlin (Grimsby Town) left footed shot from a difficult angle on the left misses to the left. Assisted by Scott Neilson with a cross. Attempt blocked. Lenell John-Lewis (Grimsby Town) left footed shot from outside the box is blocked. Foul by Scott Neilson (Grimsby Town). Attempt blocked. Lenell John-Lewis (Grimsby Town) right footed shot from outside the box is blocked. Ross Hannah (Grimsby Town) is shown the yellow card for a bad foul. Goal! Alfreton Town 2, Grimsby Town 3. Ross Hannah (Grimsby Town) converts the penalty with a left footed shot to the high centre of the goal.